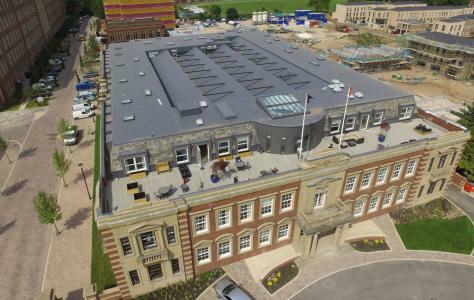 Roof Assured by Sarnafil is the domestic arm of the Sika Sarnafil brand, one of the world’s most successful manufacturers of singly ply roofing membranes. Sika Sarnafil introduced Roof Assured as a way to offer home owners roofing solutions using the same pedigree of high performing product as many high profile commercial projects. Homeowners often ask us about our commercials projects and you can read more here. One Sika Sarnafil project that always creates a warm feeling is the ex Terry’s Chocolate Factory in York. The former head office of Terry’s Chocolate Factory, it was opened by the Terry family in 1926 and is now an historic landmark with a Grade 11 listing. Once home to famous brands such as Chocolate Orange, the factory and offices were closed in 2005 and fell into disrepair. In 2009 the old HQ was put on an official at-risk register by English heritage. In spite of many challenges, it was the skill of the Sika Sarnafil registered installers and the flexibility of the Sarnafil system, that resulted in the project being finished on time and to an impeccable standard. The newly refurbished roof looks stunning and will protect the building from whatever the weather throws at it for many years to come. The sensitive approach employed throughout this inspiring project has conserved this prestigious feature of York for future generations. The Chocolate Works continues to give back to the community in its new guise and keeps it famous name as a care village.